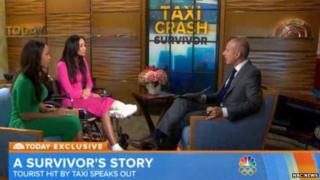 A woman who lost part of her leg when she was hit by a taxi in New York has said she is "incredibly dismayed" the driver will not face criminal charges. Sian Green, 24, of Leicester, lost the lower part of her left leg after she was hit by a yellow cab as she stood on the pavement in Manhattan, in August. Her lawyer in New York Daniel Marchese said the district attorney's office had told him no charges would be brought. Mr Marchese said she would now pursue a civil case. Ms Green had to have her leg amputated below the knee after the crash on 20 August, near the Rockefeller Centre on Sixth Avenue, in midtown Manhattan. The taxi driver involved, Faysal Himon, was ticketed by the New York Police Department for being unauthorised to drive the vehicle but faces no other sanction. In a statement, Mr Marchese said the assistant district attorney had told him the city was not pressing charges because of a "lack of evidence". "The Green family is shocked by this news, and disappointed," he said. "Despite this news, Sian continues to improve both physically and mentally since her return to the United Kingdom. "While she is incredibly dismayed by this decision, she does not let it affect her positive spirit, unbelievable strength and incredible poise, which she demonstrated to the world throughout this ordeal." Mr Marchese said Ms Green would now "aggressively pursue" a civil action against the driver. Mr Himon has always maintained a cyclist banged on the back of the vehicle, causing him to accelerate and crash into Ms Green who was on the pavement. A quick-thinking plumber used his belt to make a tourniquet for her leg, earning praise from her surgeons and celebrity doctor Mehmet Oz who was filming nearby. She spent a month in a New York hospital following the accident. The student has previously said she will continue designing her fashion line and that "nothing's going to stop me".